It’s not time to go yet, but if you want to have the most fun and scoop up as much loot as possible, here are a few Early Bird Reminders to help you do just that. 1. 1. 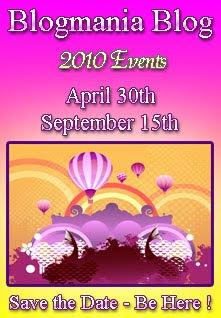 Be at any of the blogs participating in the Blogmania Event as early as possible on April 30th. The easiest way to find a Blogmania Blog is to look for the Blogmania Badge. 2. 2. This is an international event, so understand that there will be some differences in time zones. My advice is to start early and stay late to catch all the blogs. 3. 3. Each blog will have their own giveaway requirements. Read them carefully, follow through, and then move on as quickly as possible. If you run across a blog that you really like and want to spend some time exploring, copy their URL and then visit them after Blogmania is over. 4. 4. We will have a 100+ blogs for you to visit. Each one will post their number like this. ( This is blog 47 of 100) This is to help you keep track of which blogs you’ve visited, and which ones you still need to reach. I’d suggest that you prepare a blog sheet which is numbered from 1 – 120, then mark off each numbered blog as you visit them. 5. 5. All blog links provided will also have a number like (Blog 89 of 100). Look for the blogs that you haven’t yet visited and follow those links until you’ve checked off all the blogs on your sheet. 6. 6. We have all types of blogs participating in Blogmania, which means that the range of items in their giveaways are diverse. I have previewed many and they are awesome. 7. 7. Why not contact a friend and partner up. Compare notes, share loot, or organize your own friendly neighborhood Blogmania Competition. This is our first Blogmania Event, but it isn’t our last. Blogmania is a bi-yearly Giveaway Extravaganza. In fact, our next Blogmania Event will start September 15th, and do we have some cool stuff planned for you! So keep in touch with our Blogmania Blogs, because they will be giving sneak previews, secret codes, and who knows what else in the weeks and months ahead.